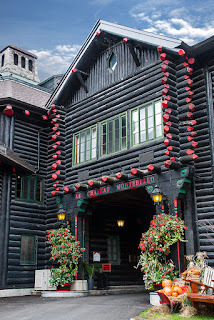 My husband, a native of Ottawa, has long wanted to visit Montebello in western Quebec, Canada. His parents were invited to stay at Le Chateau Montebello and he remembered hearing about it when he was small. 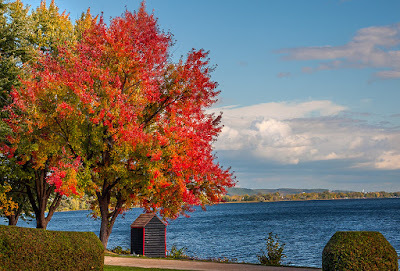 In 2015 we got there at last because our son and daughter-in-law invited us to Ottawa for Thanksgiving. 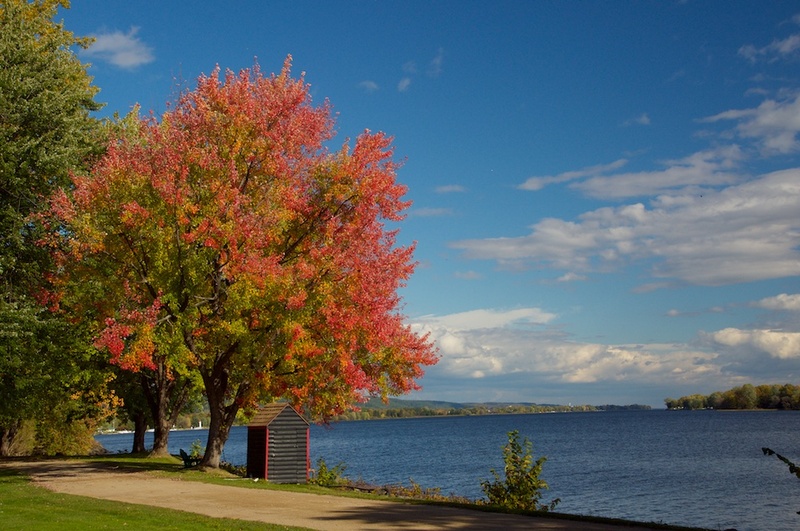 It's a perfect time to see the fall colours and we booked three nights at the acclaimed chateau. 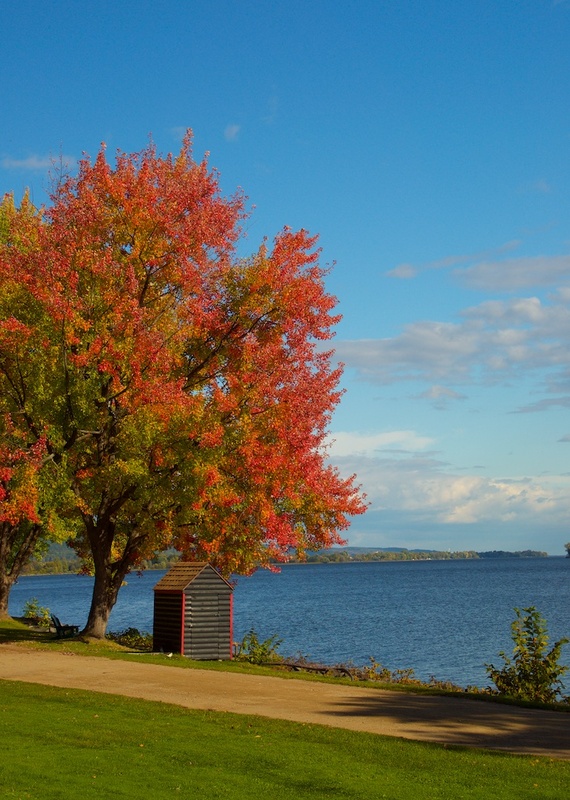 Montebello is actually a small village on the banks of the Ottawa River, an hour's drive from Ottawa. A popular vacation spot in the summer, we found in early October that most of the cafés and restaurants were closed. No doubt some would re-open for Christmas and the snowy months, but we were out of luck. The chateau gobsmacked me. 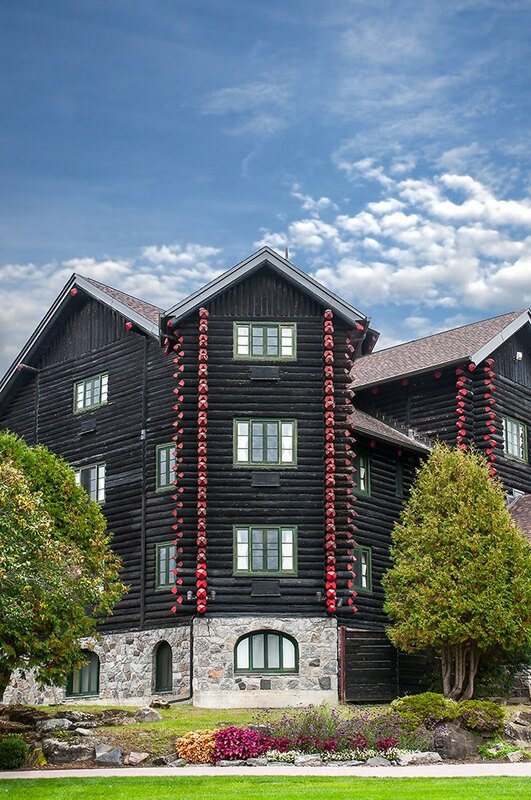 It's a vast, star-shaped log cabin built of ten thousand red cedar logs from British Columbia and it's surrounded by parkland. 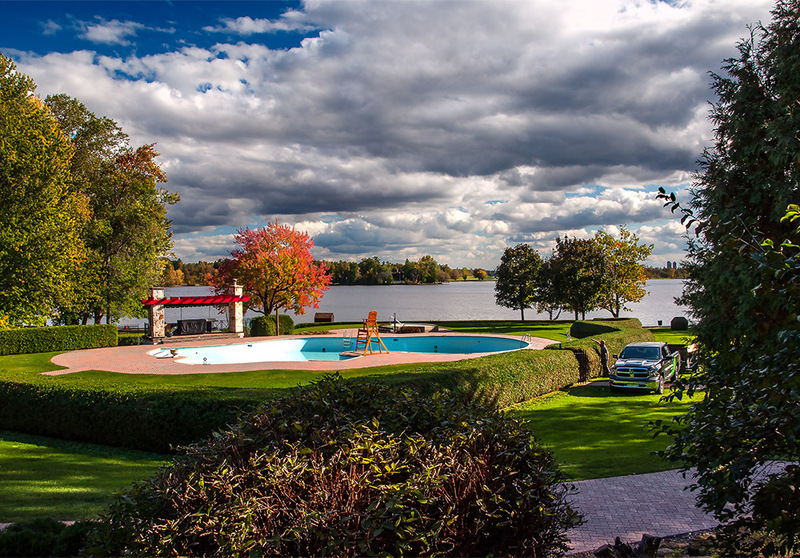 The builders took only three months to complete it in 1930 as a private vacation club for the wealthy elite from Montreal and Ottawa, as well as prime ministers and royalty. 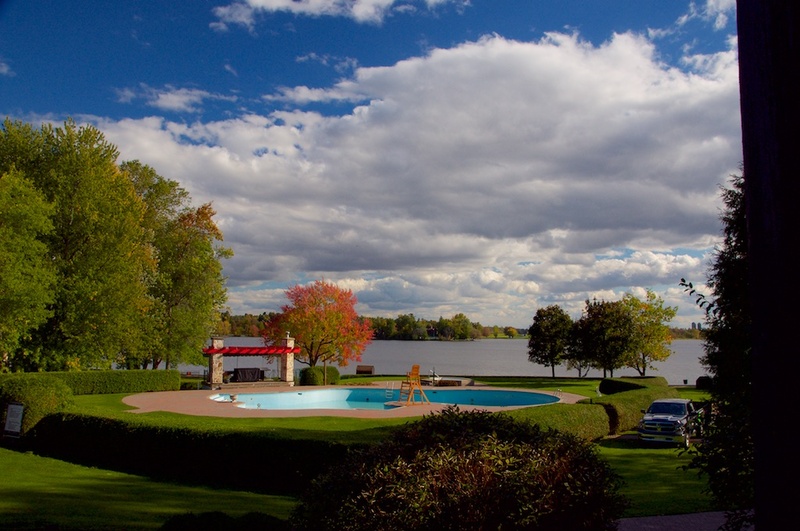 The grounds have a marina, stables, a curling rink, a golf course, indoor and outdoor swimming pools, tennis courts, and much more. The members enjoyed this club summer and winter. When it snowed they cross-country skied, skated, curled, snowshoed and attended wonderful Christmas parties. 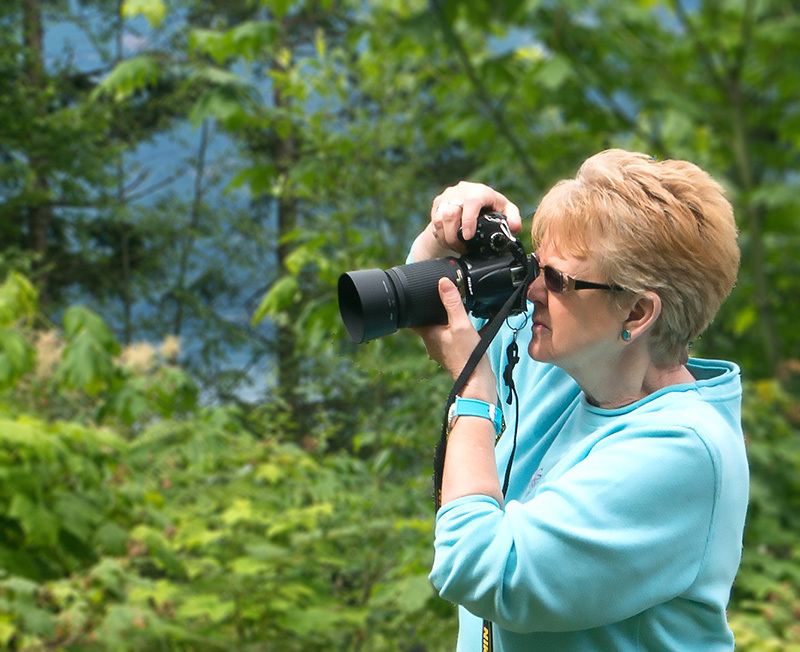 In July and August, they hiked, sailed, swam, rode, and partied some more. This lifestyle did not last and the chateau became a hotel decades after WW2 and hosted the G7, NATO, other distinguished meetings. 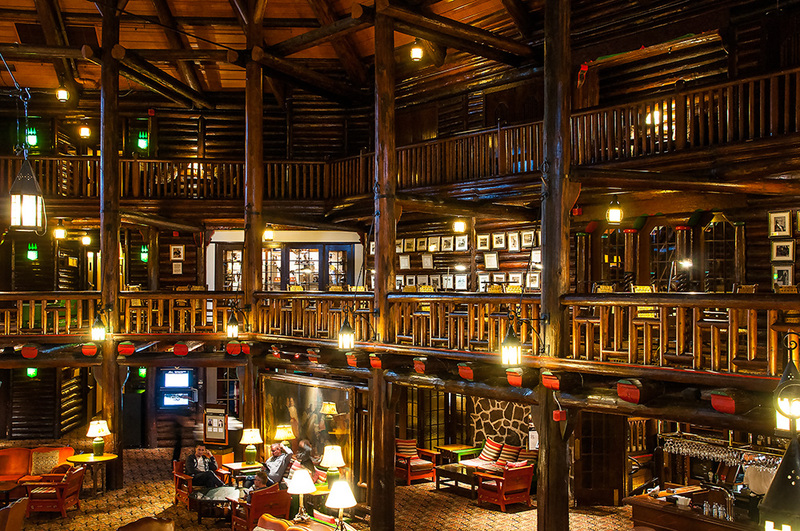 Now it's part of the Fairmont chain, recently acquired by the Accor group. 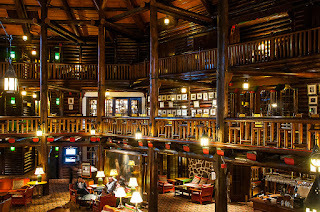 Inside the hotel is a vast circular lobby around which are the galleries of the upper two floors. 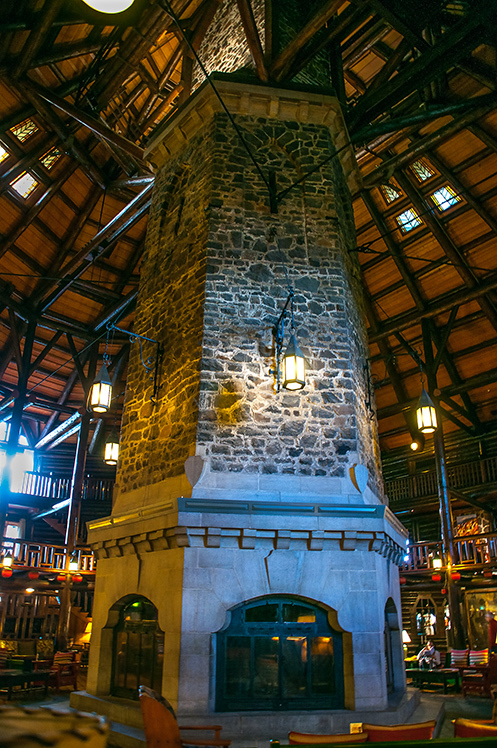 Dominating the centre is an enormous stone chimney, below which are six fireplaces surrounded by couches and arm chairs. There is a bar too, with a friendly barman, shops, and the front desk. The galleries are lined with old photos of the hotel and club members in Chateau Montebello's heyday and they are worth viewing. Around the railings are tables and chairs, often with a chess set or backgammon board to while away the time. The rooms radiate from the galleries and are good sized and comfortable. The bathrooms are small but modern, and the wifi is excellent. When guests are hungry, there are several options and they're all superb. 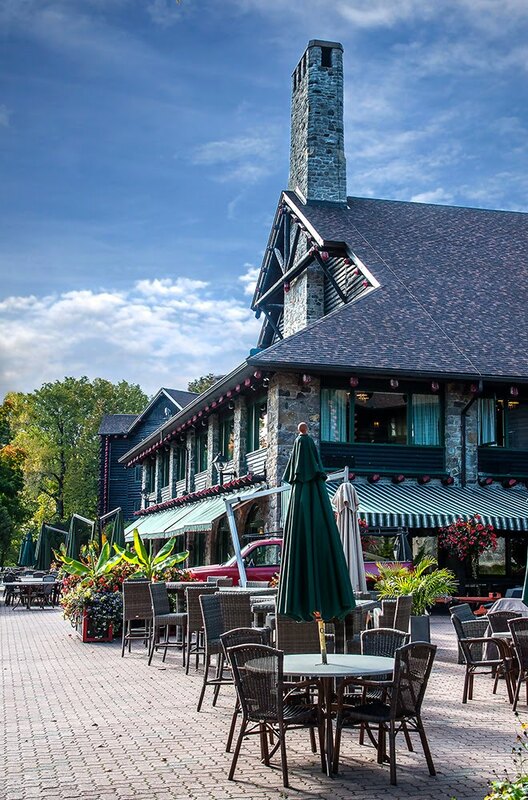 Aux Chantignoles, wraps-around the banquet room and looks out to the terrace with the Ottawa River beyond. The food was absolutely divine and most sourced locally. We had two dinners and two breakfasts here. There is also the Seigneurie Bar that serves bistro food and good local beer. 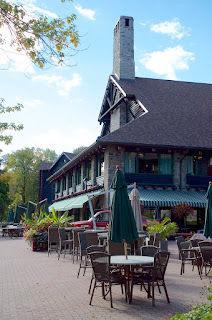 In the summer, Le Riverain on the huge terrace delivers barbecue fare. 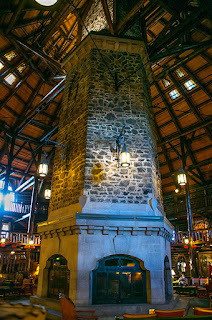 All in all Le Chateau Montebello was quite an experience combining luxury, history, politics, and more. It was a visit I was thrilled to make.